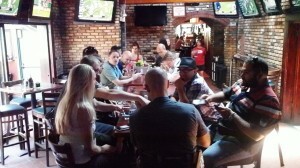 A write-up of my trip to Chicago, 26th July – 4th August 2011. 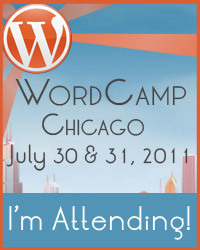 The WordCamp Chicago 2011 was my primary reason for coming over here, so it was one of the main focal points of the trip. In short, I loved it – although the talks were interesting enough, the main highlight for me was meeting the people, both the prominent names within the WordPress and Genesis communities, and new folks who I might or might not have seen online before, but were happy to talk shop, or just be friendly to the apparently only foreign guy who was attending the event. Overall, I’d say the talks and the whole WordCamp was better than the equivalent event in the UK two weeks prior – I don’t think it’s just the weather and the fact it’s abroad that made it better either (though it definitely helped). What I wanted was some code-heavy talks, and I did get to see at least one, even if I did end up correcting the speaker when he answered someone else’s question (awkward moment – sorry Jake!). 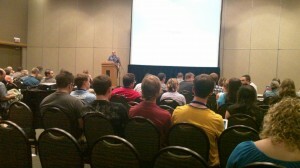 Was it worth coming all this way for WordCamp alone? For the experiences, and meeting the people, absolutely. Since I was making the trip anyway, I’d decided to add a few days before and a few days after the WordCamp into my schedule so that I could see more of Chicago. 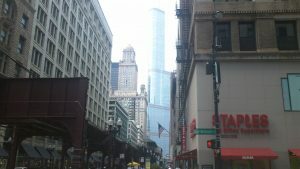 I’d never been to Chicago or the United States before, so wasn’t entirely sure what to expect. I have visited quite a few places before though, and when I’m on my own (sans wife) I can be forced to look after myself well enough. I’d asked for recommendations on things to do whilst here and I managed to work my way through a fair few of them. Millennium Park is sited over several blocks, located between the skyscrapers and Lake Michigan, on the central east side of the city. Inside the area is the Cloud Gate, the Crown Fountain, the Pritzker Pavilion and some other smaller bits, but it’s the first three that were the highlights for me. 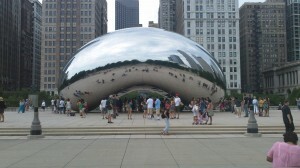 The Cloud Gate and Crown Fountain are both considered works of art and do draw most of the crowds in the park. The Cloud Gate (known locally as the Bean) gets photographers doing all sorts of things with the shiny surface reflecting both people and surrounding skyscrapers, while the Fountain mainly sees the kids enjoying the water, cooling off on the hot days. As in any major city, there are several museums covering different areas of interest within Chicago, but the only one that interested me was the one on science and industry. Being the largest science museum in the western hemisphere, there are quite a few things to see. It took me 4-5 hours to wander around, and I only gave cursory glances in the areas that didn’t interest me. They had a mixture of interactive and non-interactive exhibits, set over three levels. The layout of the museum wasn’t completely conducive to making the most of your time (i.e. not retracing your steps to get to a section you hadn’t seen yet), but I’ve seen worse. 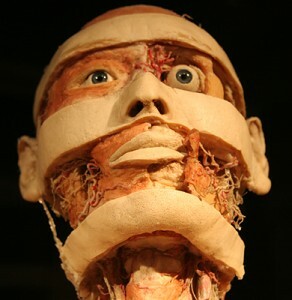 They had a Body World exhibition on, which is a collection of over 200 (real) bodies and body parts that have been plastinated to preserve them, which provides a real look into anatomy and how our bodies work. An interesting look, although the plastination process ironically makes the bodies look a little unreal. There were also some plastinated displays in a free section of the museum, so in hindsight, I’d suggest checking those out first, and getting the extra ticket for the Body World exhibit if you decided to afterwards. Formerly called the Sears Tower, this structure was for 25 years the tallest building in the world, and is currently the tallest building in the US, and the fifth tallest free-standing structure in the world. 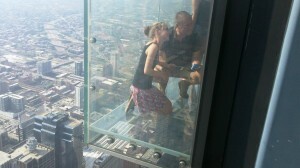 On level 103 of the 108-story building is an observation deck called the Skydeck. As well as a 360-degree view of the city and suburbs (seeing up to 50 miles on a good day), it also contains four all-glass balconies that extend about four feet outside of the main structure, allowing a view straight down to the ground. There was hardly any queue to get tickets and get in when I got there (mid-afternoon), and after passing-through a security checkpoint, the elevator ride took about a minute to go up to floor 103. The views, as you might expect, were spectacular. The glass balconies were a little busy to get into but not too bad – the main queue was 15 minutes to get the elevator back down again! Definitely worth doing, especially if you do it towards the end of your visit when you’ve already got your bearings in different parts of the city. This zoo is over 100 years old, and is the world’s largest zoo that is completely free to enter. It contains a wide variety of 1200 animals from polar bears and penguins, through otters and creep crawlies to lions, tigers and other big cats. I really am surprised that this place is free – they could easily charge £10 / ~$15 for it and it would still be good value for several hours of wandering around. The enclosures were mostly populated (although some animals were inside due to the heat) and the animals looked in good condition (I am not a vet). The layout of the park was sensible enough (though I did have to retrace my steps a couple of times) and there’s plenty of amenities on site. Definitely worth a look, especially if you have littl’uns. 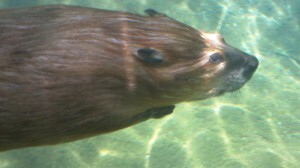 Here’s the full album from my visit to the zoo. One of the oft-mentioned tourist spots for Chicago, Navy Pier is sited at the mouth of the Chicago River and stretches 50 acres into Lake Michigan. Originally built in 1916, and revamped into its current status in 1996, the pier is about providing entertainment to tourists. There’s the usual array of kids things, bars, places to eat, as well as an arboretum, grand ballroom, expo centre and boat tours, but the main highlight for me was the view from the end of the pier back towards the skyscrapers in the city. I actually ended up at Navy Pier three times during my ten days here – it’s a great place to people watch and relax so worth doing. 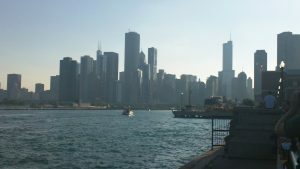 Another common suggestion for a tourist activity, from those who have done it, is the river cruise, typically one that looks at the architecture of the various skyscrapers and other buildings within downtown Chicago. Whether a building is post-modern, gothic, or some other style is not actually of that much interest to me, but I did the tour anyway, and despite the cost of it (£18+) it was a good experience. I went with the Shoreline Sightseeing company, and they provided a professional service – the boat had a bar and head downstairs, and the speaker was clear and very informative as we were going around the three strands of the river. The tour lasted just over an hour and there were plenty of photo opportunities. Worth doing, if you’ve done some of the other items on the list first. Downtown Chicago is easy to get to and easy to get around. At no point did I feel at all threatened or uneasy whilst walking about inside and outside the loop, so other than the usual vigilance about keeping you and your possessions safe, it’s not something to worry about. The obvious draws for being in the city are the skyscrapers (plenty of them! ), shopping in the Magnificent Mile. I’m not a keen shopper, so I only walked up the Mile to get to the tourist information office to get a Metra train timetable and CTA transport information. There’s plenty of hotels, corporate and commercial businesses in the area, and as per most cities, the price of a pint ($8 after a tip) is higher than in the suburbs. 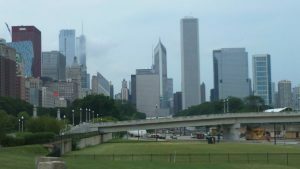 If you’re travelling anywhere in Chicago, then you’ll almost certainly not be able to avoid the downtown area – I’d definitely say it’s worth walking through some of the main streets though, rather than seeing it all go by on a bus. OK, so not a typical “attraction” but it was something that several people mentioned, and I did get to try a couple of slices (I would have struggled to have eaten a third slice in one sitting). I’m not a food critic, but I can say it was nice – the edge on the ones I had from Lou Malnati’s was a little hard compared to the very soft filling, but not un-edibly so. Not too much to say here, except that the people of Chicago and its suburbs were very friendly, polite and welcoming! 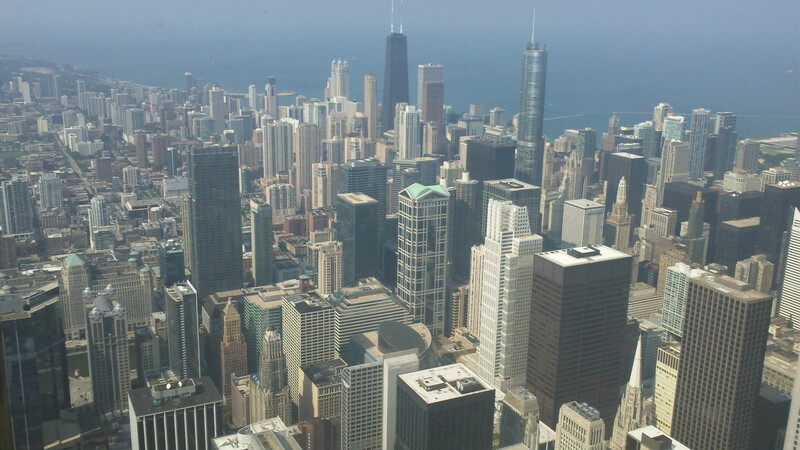 I’m not sure if there’s a Chicago accent at all – most of the voices I heard were easily understandable to my British ears and just sounded average American. The transport within Chicago is well set up overall. 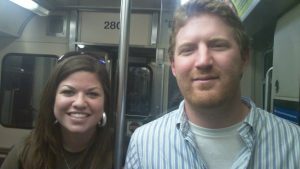 The Chicago Transit Authority seem to run two main systems of transport – the trains (a mixture of elevated (above ground) and subway on the same system) and the buses. The trains were my most common way of getting from my host’s apartment to the attractions. Since Chicago is situated next to a lake, the train system forms a hub (the Loop) and spokes (the various lines, known by their colours) heading in various degrees of north, west and south. The trains were clean, fairly regular and the information about them was tourist-friendly. if you’re in a tight schedule, I’d suggest preferring the train over the bus. The other minor criticism about the buses is that they seemed to stop almost too frequently – less than one block in some instances. There were some buses that went over extended distances without stopping though, so it’s a matter of picking the right one. The big plus point for both of these, is that there’s a wide range of tickets available – single fares start at $2.25, but far better is the travel passes, which can run for 1, 3, 7 or 30 days, allowing unlimited transport and transfers on the CTA trains (not Metra) and buses. There is also a travel card, which can be pre-loaded with credit. I used to think that the UK had variable weather, but Chicago takes that to extremes. My first few days here were overcast with the threat of thunderstorms (although I barely caught more than a few drops), but since the weekend started it’s been nothing but hot and humid. A nice change to typical UK weather! I did manage to catch a little too much sun after my river cruise, so sunscreen is definitely advised for the summer, and having seen reports on how bad the winter gets, some nice warm clothes should be brought if you’re visiting in the winter. I like Chicago and I’m really glad I came and experienced it. I’ve got no plans to come back again (I might try other parts of the US) but I would recommend it to others to go and visit!